The new TVS Jupiter takes on the dark horse, Honda Activa 4G in this spec comparison of prices, engine and specifications, mileage, features, design and dimensions. The Honda Activa has revolutionized the scooter market almost singlehandedly in India. Its immense popularity can be gauged by the fact that it outgunned Hero Splendor, the bestselling two-wheeler in the Indian market. A newer model, 2017 Honda Activa 4G was launched earlier this year in March at a starting price of Rs 50,730. The gearless scooter category is consistently gaining momentum in the country; and with its growth, the competition is growing as well. To challenge the supremacy of the Activa badge, TVS launched its new scooter, the Jupiter. The TVS Jupiter irons out most of the shortcomings of the Japanese scooter. For instance, it gets bigger under seat space which can engulf a full-size helmet with ease and exterior fuel filler. But does it get enough to usurp the champion? 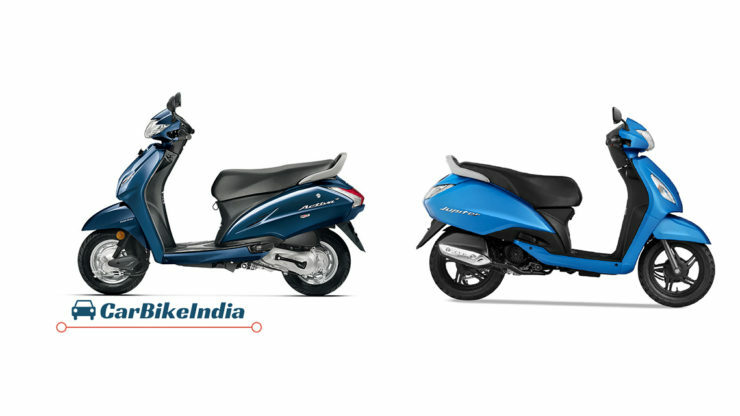 Let’s find out in this Honda Activa Vs TVS Jupiter comparison. Both the scooters are at par with each other when it comes to pricing. However, the Jupiter seems to offer more value for your money as it gets handy features. The addition of Jupiter Classic to its lineup is a smart move. The bikemaker now looks to tap the higher age bracket of 45 plus buyers. The Activa 4G is taller and wider than the Jupiter, whereas, the TVS scooter pips the Honda in the length and wheelbase department. The extra wheelbase transforms into better space for your belongings at the front and more seat area so that people with extra kilos can also fit in comfortably. The one kilogram of less weight makes the Jupiter more frugal of the two with slightly better fuel efficiency as well. The new 2017 Honda Activa 4G gets updated feature list and, of course, a fresh look compared to its predecessor. The changes largely hover around the front of both the scooters. While the Honda two-wheeler gets a smiling-face sort of front apron with center crease, the Jupiter gets larger turn indicators on either side with a smart crease that branch out at the top to tuck TVS badging in its centre. Out of the two, it’s the Jupiter that looks more youthful then the Japanese scooter. Features such as mobile phone charger and retractable hook are added in the new Activa. Despite that, the Jupiter still scores high in terms of features with practical under seat storage that can accommodate a full-size helmet, low fuel indicator and conveniently placed external fuel filler. Both the scooters are underpinned by a 109cc petrol engine which develops same figures of 8 bhp and 9 Nm for maximum power and torque, respectively. However, the Jupiter is more frugal and fun to ride while the Activa is a better handler of the two. The million dollar question for any vehicle buyer is the mileage. The Activa 4G and the Jupiter offer a company claimed mileage of 60kmpl and 62kmpl, respectively. It’s more or less similar in real world conditions. The TVS Jupiter pips the Honda Activa 4G on many fronts but the difference isn’t much to challenge your choice. It’s more about what you prefer, if you want a scooter with mature looks and fuss free experience, the tried and tested Activa should be your choice. Not to forget the strong resale value that the Japanese scooter commands in the used bike market. Whereas, if you are looking for a sportier scooter which breaks the traditional setup and is more feature-laden, the TVS Jupiter should be choice. Moreover, a test ride of both the scooters should clear the air on which one to choose. Recommended: Honda Grazia Review – Price List, Mileage, Specifications, Features, Images and more!